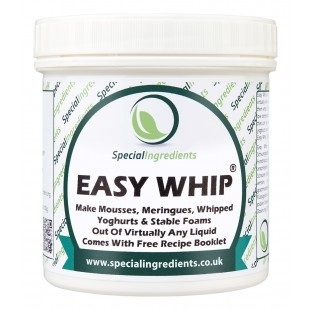 Easy whip is perfect for making light airy mousses, meringues or foams out of virtually any liquid. Simple to use, just blend easy whip into your chosen liquid then whip it into a light stable foam or mousse. Foams can then be dried out at low temperature to make meringue. Easy whip is neutral taste instant powder that can be added to any liquid sweet or savoury. 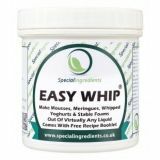 Stable foams, mousses, yoghurts and whipped diary products can be made quickly and easily using easy whip. A free recipe book is included with every purchase. Containing innovative, simple recipes and tips which can be adapted to create your own unique creative dishes. Make light airy mousses out of virtually any liquid. Make meringues out of virtually any liquid. Make whipped yoghurts from liquids. Make stable foams and whipped creams that last. Use to froth up fruit juices, milkshakes, sauces and soups. A neutral tasting universal instant powder. Free recipes included with every purchase. Methylcellulose (E464), Xanthan Gum (E415). Use at 0.5% - 1% compared to recipes weight. See recipe booklet included for ideas.